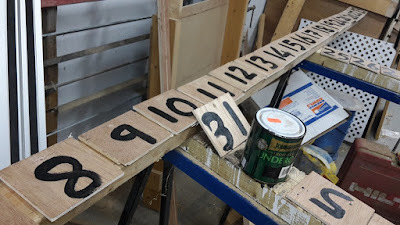 I have some first earlier in the poly tunnel, not put any outside yet, I have my beds numbered on paper I havent yet ventured into doing it on the computer, today I was thinking I should laminate the sheets then I can keep them in the ply tunnel. I'd love to see how yours is organised. Next time I go to Wales I'm going to have to arrange a visit! Known as beds 1, 2, 3 and 4, but not actually numbered. Yeah, it was when I got over 16 beds that I started to loose track! 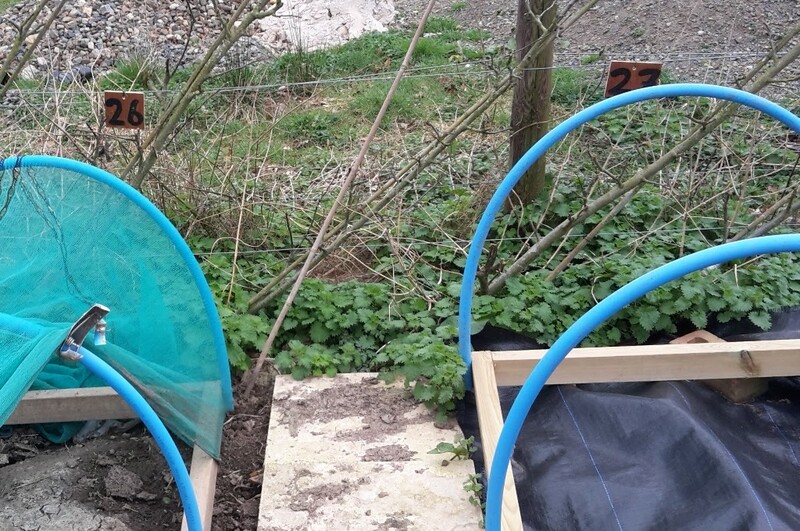 I got my Lovely Hubby to drill into the top edges of the raised beds, so the blue hoops sit in the holes. 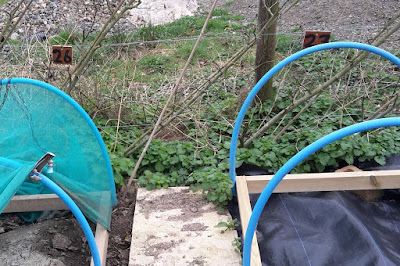 This way means that I have added height to the poly or fleece tunnels too. If you haven't got raised beds then hammering in a bit of reinforcing bar intot he ground to act as a pin works as well. Mine are built as frames so the whole thing can be moved easily but I'll make netted frames with just pipe and bar later int he year. My hubby dug plastic plumbing pip into the ground , into which I could put the hoops. When we lived on our second holding I had an all singing, all dancing printed plan of the beds. I scribbled it out all rough on paper and LH took it to work and printed it all out with straight lines and totally transformed it, it looked very posh ... too posh to scribble on in fact. It's something I definitely should do again. I like having it on the computer and then wirtting on it by hand, I can always print out more then. 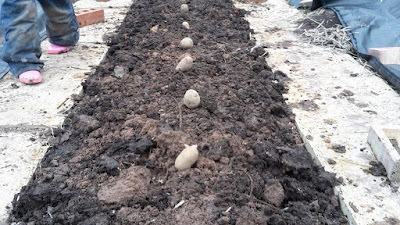 I have had to give up on growing potatoes in open ground for a while because the beds are quite new and I'm waiting for wireworm populations to reduce. Consequently I'm very jealous when I see people growing spuds in the ground! I use an embarrassingly complicated mix of numbers and letters in the kitchen garden. If I were to use numbers alone, I might feel overwhelmed by the amount of work I have to do. Somehow, the complicated system masks the tasks and breaks the work into more manageable chunks. Ridiculous, isn't it? Mustard planted one year should get rid of wire worms. This area was young fruit trees before so I hope I don't have too many troubles with it! Maybe if I make another garden next year I'll have to switch over to letters as well! wow...you are organized. i've just started my seeds. i'm quite a way off for planting yet. No seeds have been planted out yet but they#'re growing on in the greenhouse. Not long now! I am organised this year, but only in my head, so no doubt everything will sink into chaos once we start planting out! It's only because it's quiet at the monet that I feel organised, another month and it'll be a total mess!